Jacobo (Jarlin Javier Martinez) has a huge responsibility in "Manos Sucias." Photo from "Manos Sucias" Facebook page. THE story of two Afro-Columbian fisherman-turned-drug runners is told in Josef Wladyka's debut feature film, the haunting "Manos Sucias." The director and graduate of the film program at New York University's Tisch school won the Best New Director Award at the 13th Annual Tribeca Film Festival where his film is having its North American premiere. As a festival award-winner, "Manos Sucias" will screen tomorrow, the last day of the festival. JW in no way glamorizes the drug trade. In "Manos Sucias," which is inspired by actual experiences that JW learned about while teaching a filmmaking course in Buenaventura, the bottom of the drug-smuggling food chain is depicted. The film also underscores the racism that can exist in this trade, as well as in Columbia and other countries from which drugs are smuggled. Discrimination aside, Delio (Cristian Advincula), on his maiden voyage that goes anything but routine, and veteran drug runner, Jacobo (Jarlin Javier Martinez), have dreams that reach beyond their impoverished, but important Pacific coast town of Buenaventura. The former hopes to raise enough funds to make a rap album, while his older brother yearns for a better life in Bogoto. "There are not blacks in Bogota," he is reminded on more than one occasion. This is one of various ways that the film underscores the way Afro-Columbians are discriminated against in their country. At a roundtable interview with journalists a few days before the film had its TFF2014 premiere, the Brooklyn-based JW and some of his producers spoke about the film, addressing the challenges involved in shooting on location and casting the film. The main characters are theater students, but some of the smaller roles are played by locals, JW said. (See video of part of the interview above). In a film that has a long list of producers, the most prominent is Spike Lee. Not so surprising if one understands the connection between the two directors. JW is a recipient of the Spike Lee Fellowship and the veteran director was one of his Tisch professors. "He is an incredibly generous teacher," JW said. 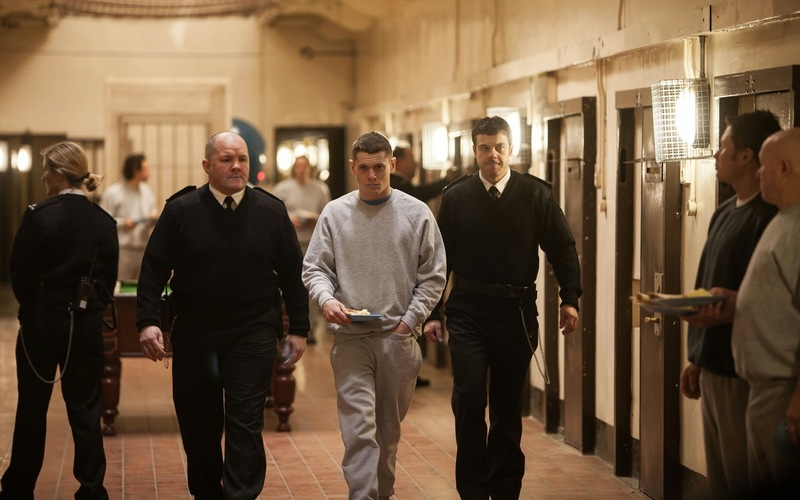 Eric (Jack O'Connell) being escorted to the big house in the Scottish prison drama, "Starred Up." Photo from Tribeca Film Festival. SL meets with his students once a week, and it is in one of these sessions that he learned about "Manos Sucias." "I showed him a rough cut and he liked it and came onboard," JW said. "I knew this was a huge opportunity that would open a lot of doors for me." "Manos Sucias" will have screenings on Sunday at 11:30 a.m. and 5:30 p.m.